There’s a friend of mine (hello Sharon!) over at New Moon Tarot who has set a 30 day blogging challenge related to the Tarot, which has come from Ree at 78 Keys. With the help of the Wildwood, I’ll answer each question for the next 30 days (but taking a break for Christmas), bringing to you the answers I have and representing the cards with The Wildwood. 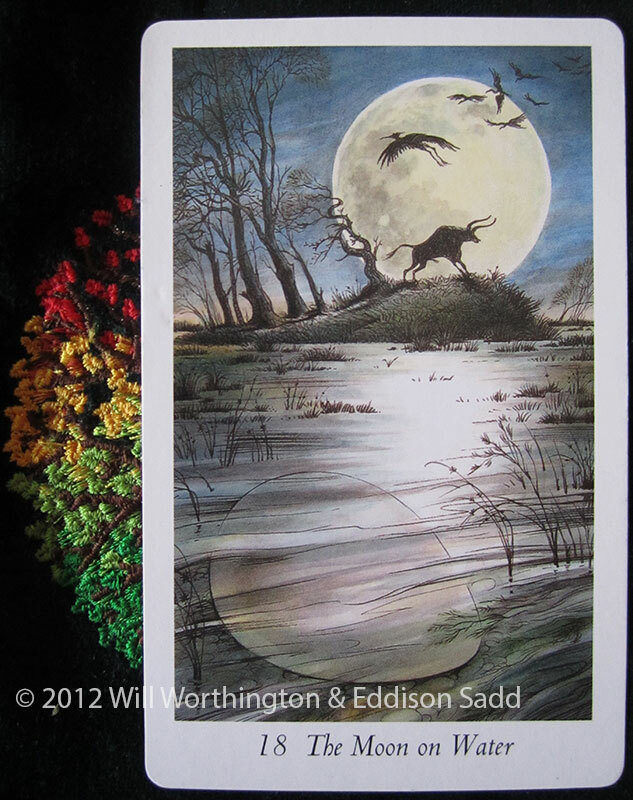 The first question for today is this: What introduced you / got you into Tarot? I asked at the shop and was directed to the Rider Waite Deck, which I purchased and bought home, along with a black silk cloth and a wooden box, which another friend of ours (Hello Daz!) said I needed to keep the cards in. In the privacy of my bedroom, I read through the little white book, then I tried to read with the cards, but what I read within the cards didn’t match the little book. I got frustrated and despondent and put them away after a few days, moaning to my friends that I didn’t think I’d ever “get the hang of them”. The next time I encountered them was at a house party of a work colleague, Alison, who pulled the cards out and read for them in front of everyone. 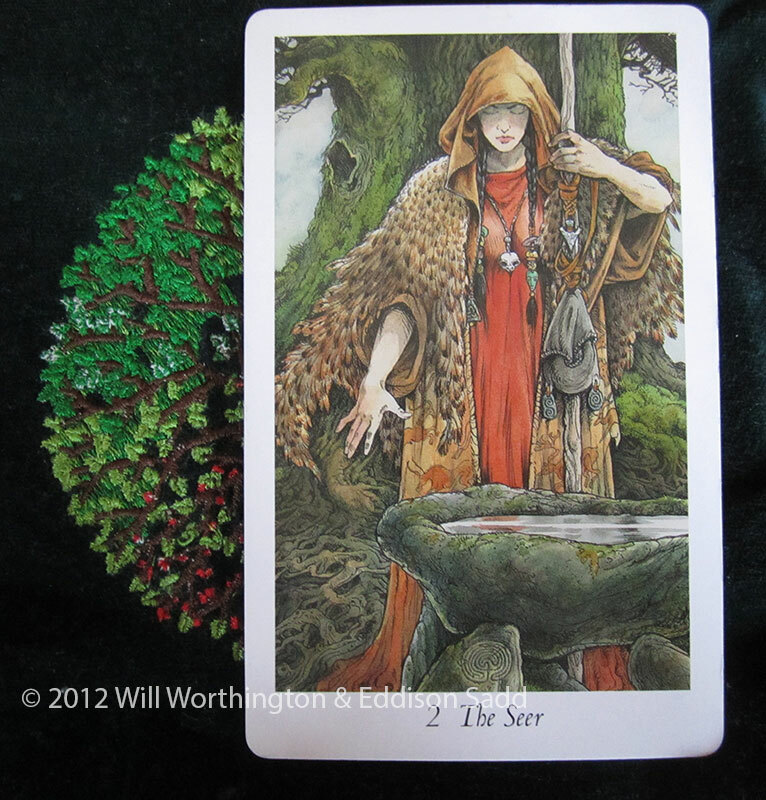 I don’t recall the exact spread (possibly the CC) or even the deck she used, BUT I do recall that it was accurate. 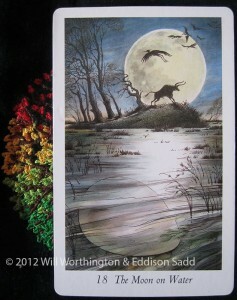 The card that came out that I remember the most, was The Moon (in The Wildwood it is known as the Moon on Water). The next time I had my cards read was at the hen party of my best friend, Emma. We’d gone up to Blackpool with a few other friends of hers and yes, we found a Tarot Reader at the Pier. We each had our cards read and again, it was accurate, but I fail to recall what deck or spread was used, it was never explained to me. Queue the next event, I got married. For a birthday present, my husband gave me a book on witchcraft. As I sat in bed that morning, playing with my new presents (which also included a Phrenology Head and a Palmistry palm) I read the book and thought: This is my LIFE! How can you know?! And then came a chapter on the tools Witches can use, one of which was yes, the Tarot . 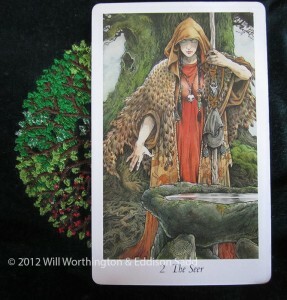 So, up I finally get, dress and hunt out my Tarot deck. Then came the next problem?? How to learn to read with them? Well, that’s another story for another time! So far, both these cards lead and show intuition, even if it’s not manifested into the consciousness, both show that I had an inward intent, an ability to listen to and be guided towards the Tarot, even if I didn’t think I was actually going to get there. This little story covers a time period of about eight years, and a lot happened in those eight years, but that’s the story of how I came to be working with The Tarot. 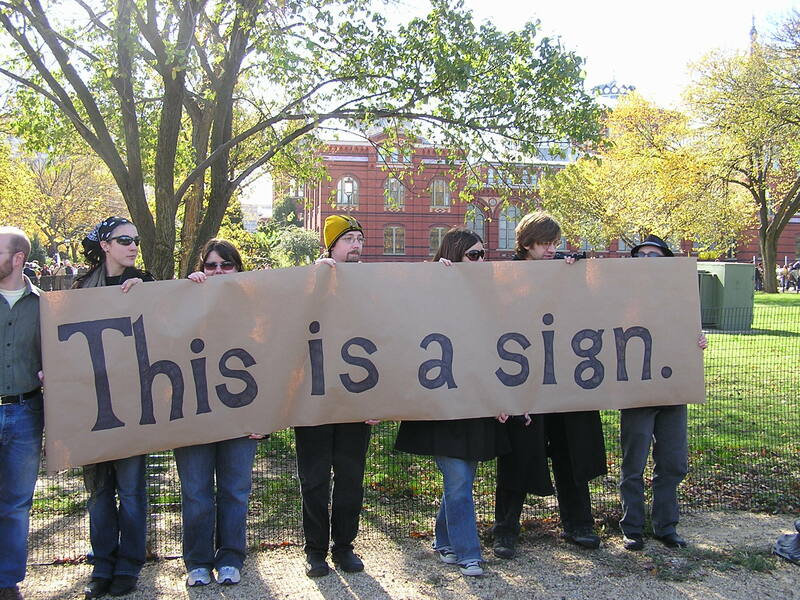 The question is: What markers are you not paying attention to, that you ought to? What do you instinctively know, but cannot articulate into words? Follow your intuition, if it’s like mine, you’ll get to where you need to be. Allow yourself to listen to the wisdom we’re all born with, the wisdom beneath our feet, in our hearts. If you’d like some help in working out what that wisdom is actually saying to you, or what the signs mean, you can book me via this page. Good luck! What a wonderful idea!!! I love it! I’m thinking I need to do this too. Hope you don’t mind.